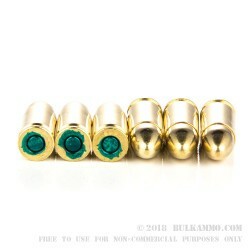 A fantastic range round for functionality testing or to “break in” new guns,. This is an extra potent round by Sellier & Bellot for the 9mm Luger. This is a clean shooting, hard hitting, full metal jacket variant with some of the best static ballistics of any 9mm Luger FMJ anywhere. The 1,305 feet per second of velocity means it will be moving enough to penetrate deeply and fly true for long distances. The 438 ft. lbs. of energy at the muzzle means you are going to ring that steel plate every time. This substantial round also features a reloadable brass case with a Boxer primer and a substantially thorough burning powder charge. 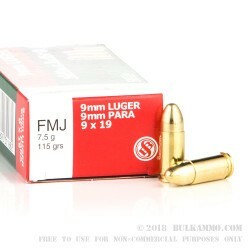 It is about the most perfect range ammunition for most 9mm firearms that you can imagine at this price point. 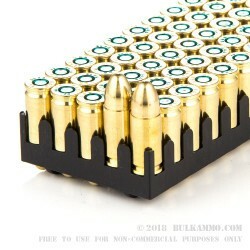 The relative value of the load and the performance of the projectile as well as the S&B reputation for reliability and their superb quality control means this is a great round to stock your shelves with. 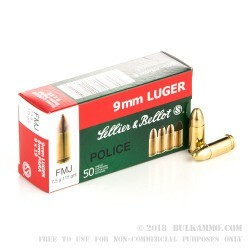 The featured ammunition is a 1000 round case lot of Sellier & Bellot POLICE ammunition that offers a potent full metal jacket target, plinking and general use load for any shooter. Excellent product. Very quick shipment. Q: S&B has recently stopped sealing the primers on their commercial production 9mm ammunition. Does this "Police" variant still leave the factory with sealed primers? Thanks. A: It's our understanding that the sealant is not being applied to any ammunition produced by S&B for export to the US commercial market, including this variant. Q: Is there a difference between the police s&b and the standard stuff that is twenty dollars less? A: The S&B "Police" ammo is loaded hotter and will deliver higher velocities than the standard S&B ammo. S&B states that the muzzle velocity of the Police 9mm ammo is 1305fps.